Bangkok, the vibrant capital of Thailand, is a living, breathing contradiction in terms: ancient yet modern, developed yet developing at the same time. It’s a unique, crowded, colorful, and noisy metropolis where you can walk the revered grounds of a gleaming, golden 16th century temple, and then grab a bite and catch the latest Hollywood blockbuster in a state-of-the art cinema. 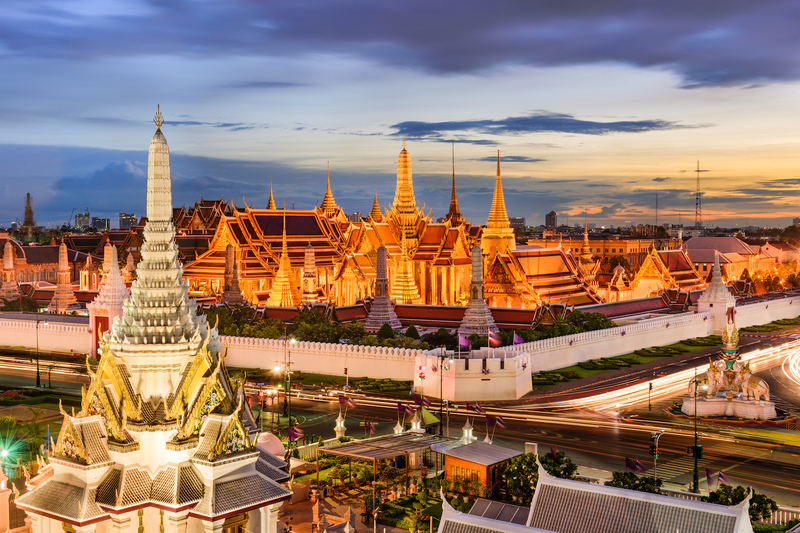 There’s so much to see and do that it can be overwhelming, so Western Union (WU) has compiled a list of 5 must-see attractions in Bangkok so you can experience the best the city has to offer. No visit to Bangkok is complete without a stop at this opulent and historical palace. Built in 1782, the Grand Palace was the official royal residence for generations, and is still used for ceremonies and to accommodate visiting dignitaries. Within the giant palace grounds, there are several beautiful and impressive buildings, including Wat Phra Kaew (Temple of the Emerald Buddha), home to the small yet world famous Emerald Buddha from the 14th century. The palace has a strict dress code. Be sure to dress neatly and modestly when entering the palace, with your arms and legs covered, and socks over your feet. If you show up improperly dressed, a booth near the entrance can provide you with clothes to cover up, but a deposit is required. Wat Pho is also the home of the Reclining Buddha, a statue so huge at 45 meters long and 15 meters high, that it cannot be viewed in its entirety at once, but rather needs to be enjoyed in sections. If you love history, you’ll be in heaven at the National Museum. Thailand’s only museum until the mid-1970s, it houses a massive collection of historical artifacts. For English-speaking travelers, most every exhibit is labeled in both Thai and English, and guided tours are also available in English. Wang Na Palace, built by Rama I, is also on the property, and houses ceremonial artifacts, games, ceramics, weaponry, and Viceroy’s throne, as well as a large collection of Buddha figures. If you love browsing outdoor markets, look no further than the Chatuchak weekend market, the largest in the world, with 15,000 stalls. In this eclectic market, you can find anything from wonderful street foods to jewelry to animals, and spend the afternoon shopping like a local. To kick your experience up a notch, arrange a tour to the Damnoen Saduak floating market in Ratchaburi, about 100 km outside of Bangkok. Here you can shop this “Venice of the East” for fresh fruit and Thai souvenirs ‘til your heart’s content, all while coasting the waters in a traditional long-tail boat. No, this attraction isn’t in an airport or a train station - it’s actually a shopping mall. In this most unusual of malls, each floor is dedicated to a different international city, transporting shoppers from Paris to Tokyo, London to San Francisco, and even the Caribbean. The San Francisco floor is famous for its abundance of restaurants and good eats, with options to please any palate. These five attractions will give you a taste of both ancient and modern Bangkok, while also allowing you ample opportunities to experience delicious Thai cuisine and interact with locals. Have you been to Thailand, and if so, what are your favorite attractions? Let us know in the comments!